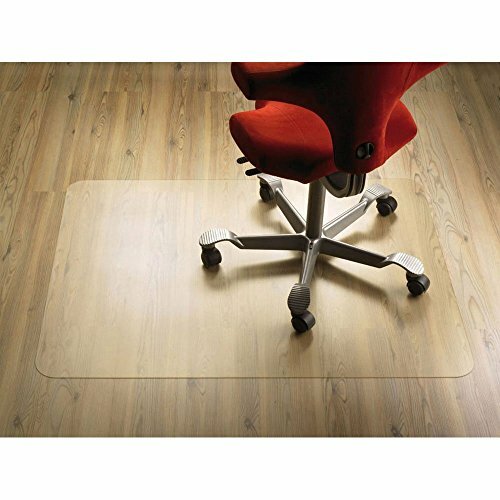 e-joy 36'' x 48'' Office Marshal Chair Mat for Hard Floors, Multiple Sizes Available, Multi-purpose Floor Protector by e-joy at Momiji Studios. Hurry! Limited time offer. Offer valid only while supplies last. Designed with a smooth backing, these desk chair mats are thick and work well on any hard surfaces including hardwood, vinyl, tile, marble and terrazo. The mat has a rigid surface texture which keeps the wheels in place while sitting at your desk working. Plant-based materials helps reduce adverse environmental and health impacts. Hardwood Protection (Not for Carpet Use), Hard Floor Rug, Non Breakable, BPA and Phthalate Free, 46" x 60"